Classification: Ureilite - anomalous, polymict. 3.95 kg, hundreds of stones. 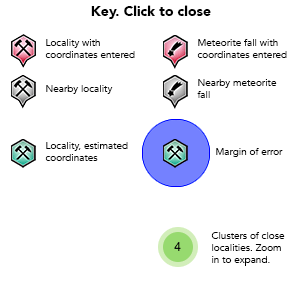 The Almahatta Sitta meteorite is the first instance of a meteorite recovery following the detection of a very small asteroid on a collision course with the earth. Approximately 20 hours after the discovery of asteroid 2008 TC3, the asteroid exploded 35-40 km above the Nubian desert — spraying hundreds of small fragments over a 28 x 5 kilometers. Several stones are over 200 g in mass, but most are quite small. The fragments are dark and usually roundish in shape. 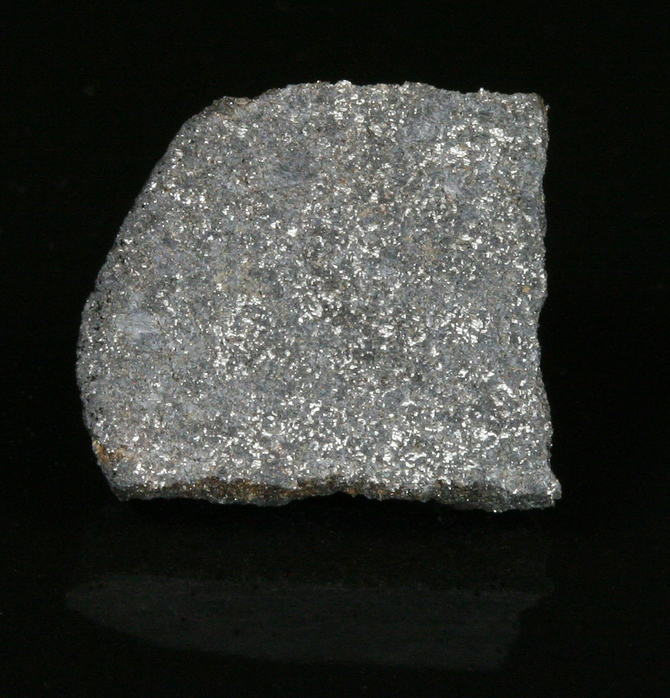 The meteorite belongs to the relatively rare class of asteroids called “Ureilites” (after the prototype Novo Urei, an 1886 fall). Almahatta Sitta is the most massive of the six witnessed Ureilite falls. The Ureilites are composed primarily of olivine and pyroxene (pigeonite is particularly prominent). However, ureilites are best known for their diamonds — quite small, but seemingly indicating enormous pressures from shocks suffered in ancient impacts. The ureilites also usually contain a number of minor opaque minerals such as kamacite (meteoritic iron) and troilite (an iron sulfide). The ureilites are particularly intriguing because their microscopic textures may have been due to both vapor condensation and to shock impact. Both the relative importance and the timing of these nebular and collisional processes does not appear to be a settled matter at this time. A 2018 study suggests that the relatively large size of the diamond crystals show this meteorite came from a parent body of between moon and mars size that was catastrophically disrupted by an impact during the first ten million years of the solar system. Reference: Michael Zolensky et al. (2010). Mineralogy and Petrography of the Almahata Sitta ureilite, Meteoritics & Planetary Science 45, #10-11, 1618-1637. (Oct/Nov 2010). Reference: Addi Bischoff, Mariam Horstmann, Andreas Pack, Matthias Laubstein & Siegfried Haberer (2010). Asteroid 2008 TC3—Almahata Sitta: A spectacular breccia containing many different ureilitic and chondritic lithologies. Meteoritics & Planetary Science 45, (#10-11), 1638-1657-1667. (Oct-Nov 2010). ; Bischoff, A., Horstmann, M., Barrat, J-A., Chaussidon, M., Pack, A., Herwartz, D., Ward, D., Vollmer, C.& Decker D. (2014) Trachyandesitic volcanism in the early Solar System: Proceedings National Academy Science 111 (35): 12689-12692. Reference: Bischoff, A., Horstmann, M., Barrat, J-A., Chaussidon, M., Pack, A., Herwartz, D., Ward, D., Vollmer, C.& Decker D. (2014) Trachyandesitic volcanism in the early Solar System: Proceedings National Academy Science 111 (35): 12689-12692. Reference: Mariam Horstmann, Addi Bischoff, Andreas Pack & Matthias Laubstein (2010). Almahata Sitta—Fragment MS-CH: Characterization of a new chondritic ltype. Meteoritics & Planetary Science 45, (#10-11), 1657-1667. (Oct-Nov 2010). Reference: Addi Bischoff, Mariam Horstmann, Andreas Pack, Matthias Laubstein & Siegfried Haberer (2010). Asteroid 2008 TC3—Almahata Sitta: A spectacular breccia containing many different ureilitic and chondritic lithologies. Meteoritics & Planetary Science 45, (#10-11), 1638-1657-1667. (Oct-Nov 2010). Reference: Michael K. Weisberg, Caroline Smith, Gretchen Benedix, Cristopher K. D. Herd, Kevin Righter, Henning Hack, Akira Yamaguchi, Hasnaa Chennaoui & Jeffrey N. Grossman (2009). The Meteoritical Bulletin, No. 96, September 2009, Meteoritics & Planetary Science 44, (#9), 1355-1397. Reference: Addi Bischoff, Mariam Horstmann, Andreas Pack, D. Herwatz, & S. Decker (2013). 76th Annual Meeting of the Meteoritical Society, held July 29-August 7, 2013 in Edmonton, Canada. Published in Meteoritics and Planetary Science Supplement, id.5104. (Sept 2013). ; Bischoff, A., Horstmann, M., Barrat, J-A., Chaussidon, M., Pack, A., Herwartz, D., Ward, D., Vollmer, C.& Decker D. (2014) Trachyandesitic volcanism in the early Solar System: Proceedings National Academy Science 111 (35): 12689-12692. Reference: Mariam Horstmann, Addi Bischoff, Andreas Pack & Matthias Laubstein (2010). Almahata Sitta—Fragment MS-CH: Characterization of a new chondritic ltype. Meteoritics & Planetary Science 45, (#10-11), 1657-1667. (Oct-Nov 2010). ; Bischoff, A., Horstmann, M., Barrat, J-A., Chaussidon, M., Pack, A., Herwartz, D., Ward, D., Vollmer, C.& Decker D. (2014) Trachyandesitic volcanism in the early Solar System: Proceedings National Academy Science 111 (35): 12689-12692. Description: Iron (Ni< 0.1% Ni). Reference: Ahmed El Goresy, Y. Lin, L. Feng, M. Boyet, J. Hao, J. Zhang & L. Dubrovinsky (2012). Almahata Sitta EL-3 Chondrites: Sinoite, Graphite, and Oldhamite (CsS) Assemblages C- and N-Isotopic Compositions and REE Patterns. 75th Annual Meeting of the Meteoritical Society, held August 12-17, 2012 in Cairns, Australia. Published in Meteoritics and Planetary Science Supplement, id.5108. ( Sept2012). Reference: Michael K. Weisberg, Caroline Smith, Gretchen Benedix, Cristopher K. D. Herd, Kevin Righter, Henning Hack, Akira Yamaguchi, Hasnaa Chennaoui & Jeffrey N. Grossman (2009). The Meteoritical Bulletin, No. 96, September 2009, Meteoritics & Planetary Science 44, (#9), 1355-1397.; Bischoff, A., Horstmann, M., Barrat, J-A., Chaussidon, M., Pack, A., Herwartz, D., Ward, D., Vollmer, C.& Decker D. (2014) Trachyandesitic volcanism in the early Solar System: Proceedings National Academy Science 111 (35): 12689-12692. Reference: Mariam Horstmann, M. Humayun, D. Harries, F. Langenhorst, N. L. Chabot & Addi Bischoff (2012). 43rd Lunar and Planetary Science Conference, held March 19-23, 2012 at The Woodlands, Texas. LPI Contribution No. 1659, id.1876. Weisberg, Michael K., Caroline Smith, Gretchen Benedix, Christopher D. K. Herd, Kevin Righter, Henning Haack, Akira Yamaguchi, Hasnaa Chennaoui Aoudjehane & Jeffrey N. Grossman (2009). The Meteoritical Bulletin, No. 96, September 2009. Meteoritics & Planetary Science: 44(9): 1355–1397. Bischoff, Addi , Mariam Horstmann, Andreas Pack, Matthias Laubstein & Siegfried Haberer (2010). Asteroid 2008 TC3—Almahata Sitta: A spectacular breccia containing many different ureilitic and chondritic lithologies. Meteoritics & Planetary Science: 45(10/11): 1638-1657-1667. (October - November, 2010). Zolensky, Michael et al. (2010). Mineralogy and Petrography of the Almahata Sitta ureilite, Meteoritics & Planetary Science: 45(10/11): 1618-1637. (October-November, 2010). Bischoff, A., Horstmann, M., Barrat, J-A., Chaussidon, M., Pack, A., Herwartz, D., Ward, D., Vollmer, C.& Decker D. (2014) Trachyandesitic volcanism in the early Solar System: Proceedings National Academy Science 111 (35): 12689-12692.